You didn't need an admission ticket to attend the football games of the Green Bay city team in 1919. The team played at Hagemeister Park on a large open field with no seating or fencing. It is widely believed that a hat was simply passed at these games, giving the fans the choice, peer pressure not withstanding, of making a donation or not. The earliest tickets were probably nothing more than a common "carnival" type ticket with printed numbers, similar to the type of tickets often still used for raffles at Benefits today. The team charged 50 cents to see a game in 1920, but fans only paid if they sat on the new, but small capacity bleacher seating. Ticket prices rose for the start of the 1921 season, and further increased once during the season. Tickets prices for the start of the 1922 football season were $ 1.10 and $ 1.65 per game, but increased to $ 1.65 and $ 2.20 in time for the November 12, 1922 Minneapolis game. The Packers needed to raise the ticket prices because of the financial losses being incurred by the team. These new ticket prices seem a bit high for 1922. Please consider that ticket prices were $ 1.50 and $ 2.00 for the October 23, 1927 game with the New York Yankees, featuring the eel-hipped Harold "Red" Grange. Fans wanting to see the great "Ice Man" play, however, were in for a disappointment as he was on crutches and didn't play in the game. The ticket evolved from the "carnival" type into a larger, perforated ticket that was torn by the ticket taker at the park admission gate. A full ticket, when torn, produces two stubs. The larger stub is more valuable than the smaller stub. The ticket taker would nearly always keep the large portion of the ticket, and return the small stub to the fan. 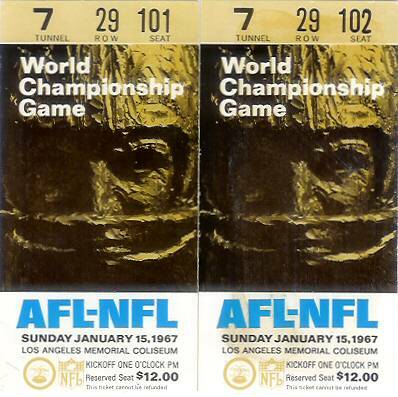 The small stub contained the month and day of the game, and the seat location. The Packers had 903 full season ticket holders in 1935. This rose to 1,400 +/- in the late 1930's, and to 2,800 +/- in the very early 1940's. This ticket stub, measuring approx 1 1/2" x 1 1/2", was for the 1936 Packer Bear game in Green Bay. The team names and year would have been printed on the large portion of the ticket that was kept by the ticket taker. The below ticket is a full, unused ticket to the Pittsburgh vs. Green Bay game of October 23, 1938. The large red 6 denotes that this was the 6'th home game for the Packers 1938 season. The ticket price was $ 2.00, tax free. From 1923 to 1997, if the Green Bay Packers Corporation were to dissolve, all the assets of the Corporation would have went to the Sullivan-Wallen Post No. 11 of the American Legion for the purpose of creating a soldier's memorial. The bearer of this ticket stub witnessed the Packers 27-0 pounding of the New York Giants in the 1939 World's Professional Championship game played in Milwaukee, WI on December 10, 1939. The Giants edged the Packers 23-17 for the 1938 crown. This stub measures approx. 1 1/2" W x 2" H.
To view the current value of Green Bay Packer full tickets and stubs for home games from 1926 to 1949, please visit our Program Guide.